When it comes to skin allergies, we know they can bring uncomfortable symptoms that can impact our daily living. Fortunately, to help doctors figure out if patients are allergic to something within their environment, they can utilize the tool of patch testing. Patch testing involves placing allergens onto the skin, removing them in 48 to 72 hours and observing for allergic or irritant reactions. If you’re wondering what allergens are, allergens can be any substance which causes an allergic reaction. They can come in the form of synthetic chemicals, ingredients found in cosmetics, skin care, make-up, household items, and even industrial items such as inks, varnishes and polishes. They can be metals such as nickel and ingredients in topical antibiotics such as bacitracin. Allergens can include pet dander, pollen and even plants. Why do we patch test? Results from patch testing can tell us if something in the patient’s environment is contributing to an eczema flare or causing the recurrent skin rash. In addition to finding positive reactions, negative readings are also useful for the patient to know. A patient testing negative to nickel can feel comfortable knowing he or she can come into contact with nickel filled or nickel made items without developing any reaction. A patient testing positive to fragrance will have the knowledge moving forward on how to avoid this ingredient in the products he or she buys and uses thus avoiding and minimizing any skin reactions. Will patch testing tell me why I have a rash? Patch testing is a tool. Unfortunately, it doesn’t always provide the answer to all of life’s rashy problems. Many patients think after patch testing, he or she will find out what specifically is irritating their skin or is the cause of their rash. This is ideal but isn’t always the case. Patch testing helps test specific allergens and identify if any of those allergens cause an irritant or allergic response in the skin. Once patch testing is completed and positive allergens have been identified, the patient needs to play Sherlock Holmes to identify items to eliminate from the environment. Sometimes after eliminating the offending allergens, patients do get better and remain rash free, however this isn’t always the case. We must keep in mind, with patch testing there can be false positives and false negatives. It's possible to react differently each time when being tested. In the United States, there are 2 commonly used tests; True Test and Chemotechnique Diagnostics. True Test is a ready to use patch test system consisting of 3 panels testing a total of 29 allergens or allergen mixes. Allergens are prepared in hypoallergenic gels already attached to surgical paper tape backing. Chemotechnique Diagnostics offers a little over 30 different series each containing multiple allergens. For example, the North American Baseline Series which contains a broad variety of allergens and allergen mixes has 50 different allergens/ mixes for testing. Allergens, available in syringes are placed on chambers already attached to paper tape and then placed securely onto the patient’s back. Usually, additional tape is placed to secure the allergens to ensure they don’t shift or move. There are no needles or injections. After 48hours, tape and allergens are removed and a first reading is performed. Sometimes there will be no reactions seen at the first reading so a second reading 24 hours later is performed (72 hours since the allergens were first applied). Reactions if noted can be irritant or allergic. Irritant reactions are local to the skin and not immune mediated whereas allergic reactions are immune mediated and can extend beyond the area of allergen contact. Once all readings are final, review and education should be provided to the patient about the positive allergens and on their avoidance. What kind of allergens can be tested? Any kind of stretching motion of testing area should be avoided (e.g. do not stretch the shoulders and arms if patch testing is performed on the back) this is to prevent the allergens from shifting, coming off or mixing together on the skin. 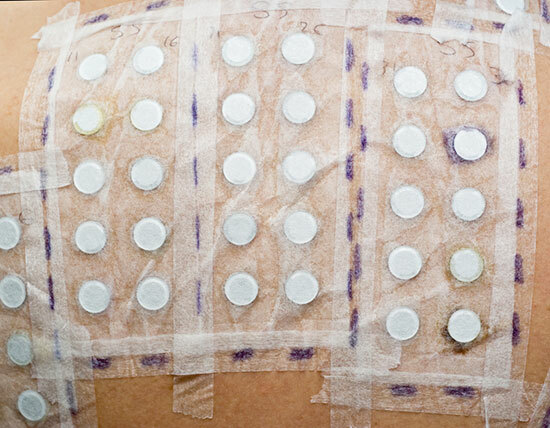 Patch testing is an invaluable tool used by dermatologists and can provide helpful information. If you’ve been diagnosed with an allergic skin rash or suspicious your recurring rash may be caused by a product you’re using, patch testing could be an option for you. Everyone’s situation is unique so it is important to discuss your thoughts and concerns with your physician.